Toss dirty diaper in the diaper pail. I use a dry pail, no soaking diapers. Covers only get washed if they smell horrendous or have poop on them. After 3-4 days, or when I notice we are down to one or two prefolds, dump diapers into washing machine. This is the most unpleasant part of the entire routine. Since I have a front loader, I can't just "dump" the diapers in really, so I use a latex glove to help them along into the washer. Usually, no rinse, because I usually have little to no poop on my diapers thanks to infant potty training. If there is a lot of poop in a particular load, I might do a cold rinse first. For more on how to handle poop with cloth diapers, read this post. Wash on normal cycle: wash warm, rinse cold. I use Charlie's Soap Powder . I used to wash in hot, but Green Baby Guide inspired me to switch to warm (they wash in cold, but I haven't made it there yet, for psychological reasons). Usually, no extra rinse either. No pre-rinse, no post-rinse, just a normal wash cycle. Dry in the dryer or line dry. I always line dry covers and synthetic inserts. I make zero attempt to remove stains. 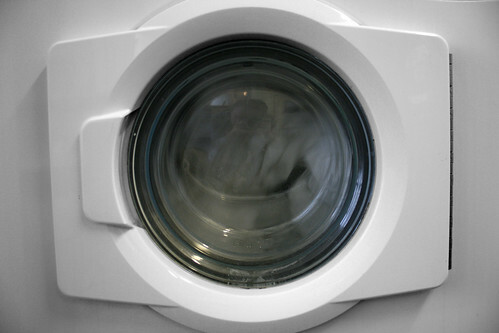 When the diapers seem really stinky, sometimes I add baking soda to the wash (with detergent) and vinegar to the rinse (put it in the "fabric softener" dispenser), and then do an extra rinse afterwards. I also occasionally wash with no detergent on super hot to try to get out any residue. When I say occasionally, I mean every 2 to 6 months.